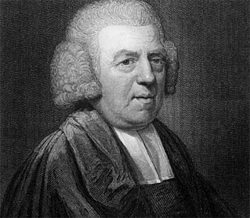 John Newton (1725-1807) served for decades as a sailor for the British Navy and on British slaving ships. A terrifying storm led to his conversion to Christ. Back in England his studies in the Bible and Biblical languages eventually led to his appointment as an Anglican priest. He became well known as a preacher, a pastor, and a composer of hymns, including "Amazing Grace." Eventually Newton became a leader in the movement to abolish slavery, speaking forcefully from his experience. His regret over his role in the slave trade no doubt figures in his poem on the prodigal son found below. I'll seek a servant's place. Father, I've sinned - but O forgive!